Through the enforcement of recent statutes put in place, little by little peace is being restored in the Puno region, situated at the south of the Peruvian Andes, after recent conflict and social unrest (both related to mining [es]), that resulted in the deaths of six, more than 30 wounded and millions in material losses: the Juliaca Airport alone suffered an estimated 2 million dollars in damages [es]. Quechua residents of Azángaro (north of Puno) left Juliaca on Saturday night and the Aymara in the south of the region lifted the blockades on the streets on Sunday. 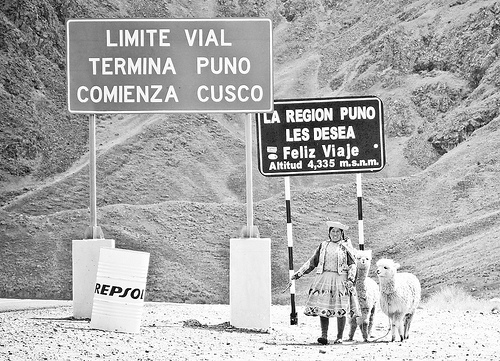 Road between Puno and Cusco blocked by Aymara in days past. Photo by Juanma Merino, Flickr user, nXpected (CC BY-NC-SA 2.0). These native communities of the mining region of the Ramis River have given a temporary truce to President elect Ollanta Humala's government, during which related issues concerning mining concessions are in the process of revision [es] in the southern zone of Puno. In the meantime, Humala has declared it a “constitutional responsibility of the present government” [es] to resolve the problem by July 28 when its term ends. One of the enforced statutes declares the environmental recuperation of the Ramis and Suche [es] river basin a national interest [es], a greatly expected measure for the peasant residents of the area; the rest are associated with the regulation of mining activity [es] in the Puno region. The most commendable, for the Aymara community, is the repeal of Supreme Decree 083-2007-EM, that puts an end to the Santa Ana project [es] of the Bear Creek Mining Company. Social networks are buzzing with commentary. Defensoría del Pueblo tiene 87 meses de informes de conflictos sociales (incluido el de Río Ramis) y Alan García ‘naca la pirinaca’ [no hace caso]. The District Attorney has 87 months of reports of social conflict (including that of the Ramis River) and Alan Garcia doesn't give a s***. Ahora entiendo porque dicen Peru no tiene instituciones: la Fiscalia de Puno no investiga la muerte de los punenos! Los muertos son pobres!! Now I understand why they say that Peru has no institutions: the DA's office in Puno isn't investigating the deaths of its people. Those who died are poor. As far as the change of leadership is concerned, which will take place on the July 28, analysts like Paula Vilca highlight some of the tasks left in suspension [es] in the region for Ollanta Humala's government, focusing on reaching permanent solutions in the region. These include: enforce the Law of Prior Consultancy, eliminate informal mining in the zone of conflict, (which means to legitimise it), implement a plan for territorial restructuring and recuperate the natural environment of the Ramis River basin which affects the Titicaca Lake.